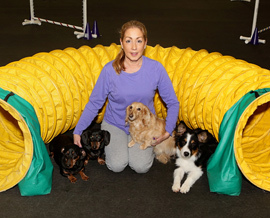 Kim's Dog Coaching believes in keeping dogs in their homes with their families, and out of shelters. Most dogs are surrendered to shelters due to easily correctable behavioral problems. To achieve this, one needs to understand normal canine behavior and teach the dog appropriate behavior using positive reinforcement methods that help to form a healthy relationship. All dogs have physical, mental and emotional needs that should be met in order to have a healthy, happy, and well-adjusted animal. Additionally, dogs do not come with a clear understanding of what humans consider important in order for the two species to live in such close proximity; it must be taught! Dog training solves problems, prevents bad habits from forming, builds confidence, and it rewards your efforts with the pleasure of working and playing together, forging a lifelong bond. Our purpose is to make everyday life with your dog easy and fun. We teach skills that you will actually use and solutions that you can easily follow at home. Our approach is flexible, because experience has taught us that there is no one way to teach every dog, or to address each issue. The one constant in all our training is that the experience will be a positive one for people and dogs alike. We will respond to your questions about dog training and dog care with informed answers, practical suggestions, and encouraging words. In addition, after your lessons have ended, we are always just a phone call away, to help with any issues that may arise along the way. After all, learning never really ends! Through training, we can help strengthen the bond between you and your dog! References available upon request. Kim was on TV on WGN Channel 9! See the video clip here! 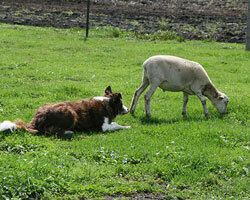 WGN did a story on sheep herding with your dog, featuring Kim, Scott, Jack, Elvis, Rookie and Mick. Check it out!